This book explores the theory and methods of systems analysis and computer modeling as applied to problems in ecology and natural resource management. It reflects the problems and conflicts between competing uses of limited space and the need for quantitative predictors of the outcome of various management strategies. Bill Grant has taught ecological modeling in the Department of Wildlife and Fisheries Sciences (WFSC) at Texas A&M University since 1976, has served on the Board of Governors and as President of the International Society for Ecological Modeling, and has been Associate Editor of the international journal Ecological Modelling since 1997. Ellen K. Pedersen is the author of Ecology and Natural Resource Management: Systems Analysis and Simulation, published by Wiley. Sandra L. Marín is the author of Ecology and Natural Resource Management: Systems Analysis and Simulation, published by Wiley. Basic Concepts of Systems Analysis and Simulation. THEORETICAL FRAMEWORK: FOUR PHASES OF SYSTEMS ANALYSIS. PRACTICAL GUIDE TO SIMULATION-MODEL DEVELOPMENT AND USE. Modular Representation of System Structure and Dynamics. Reporting the Development and Use of Simulation Models. APPLICATION OF SIMULATION MODELS IN ECOLOGY. Population Dynamics: Effects of Density-Independent andDensity-Dependent Factors. 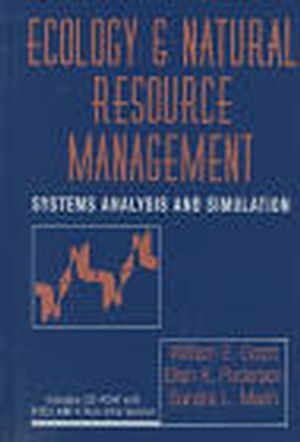 APPLICATION OF SIMULATION MODELS IN NATURAL RESOURCEMANAGEMENT. Forest Management: Effects of Timber Harvest on the RelativeAbundance of Wildlife Species.